Knowing how to talk to your kids about racism is as important as ever. It can be uncomfortable. It can be a challenge and lead to questions that you may not have the answers to. Dialogue is not only necessary, but critical for our kids to refrain from stereotypes, harboring anger or misperceptions. When we do not talk about prejudice, injustice, anger and other ugly things it’s a disservice to our kids. The question is, how do I talk to my young person about the dark, angry injustice that is and has gone on in our society? 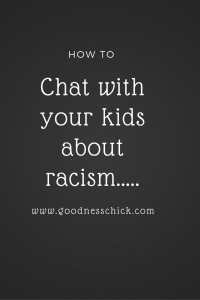 How to talk to your kids about racism…. 1) I believe truth is precious, although painful. We are a nation of layered history. Wars were fought (on and off battle grounds) for freedoms and equality. Not too long ago African American’s were not permitted to attend the same schools, use the same bathrooms or water fountains as white people. Many lost their lives for standing against oppression and fighting for equality. Their previous generations had family members who were owned and enslaved by another human being and exploited. Stereotyping and profiling still occurs on a daily basis for many black men, women and children. As a white female, my heart aches for the injustice so many have faced that I will never be subjected to. I believe the only way this can stop is to empower our young people of all races with compassion, awareness and a burning desire for equality across the board. 2) History: we must be truthful with our kids about our nation’s history, but do not withhold the many positives. Many fought with words (not their fists) for equality. Martin Luther King, Robert F. Kennedy and Rosa Parks to name a few. We must not allow history to go to the way side; this is a frightening thing. History can repeat itself if ignorance and lack of awareness preside. This generation and those to come must be aware of the ugly, beautiful, heart breaking and inspiring layers of our country. If we opt to remove these reminders it’s easy to deny or diminish the magnitude of what was, what is and what we must continue to keep striving for. If you have never been the victim of racism or bigotry it’s impossible to wrap your mind around what someone on the receiving end has experienced. To dismiss this fear and discomfort is a mistake and only adds to the problem. 4) You lay the groundwork: Discussion in the classroom is great. Know that your comments and attitude as a parent in your own home holds greater value. Have conversation about situations your kids have been in, witnessed or even heard about in the news. Know your words will only speak loud when actions connect. What does this mean? You can encourage equal view and treatment of others. Know words do little if your own do not align.If a comment is made about race when you drive a car, when you watch a movie, etc (even in jest) your words of equality hold no weight. Our kids watch, listen and absorb. If we are to lay the groundwork for a next generation of young people who believe in equality and strive for this our words and actions must align. Today’s Parent article on how to talk to your kids about racism by their age is a great read. Definitely take time to read it if you have children in different age brackets. The more we talk AND listen with our young people about the past, present and future in regard to racism it will only strengthen their resolve and our future. This is not an easy topic. Know that it isn’t easy for those who have been on the receiving end of racism and hatred. Our voice and action can change the world. I believe that with all of my heart. This starts with how we choose to lay the groundwork in our own homes. It starts with you. It starts with me. May we face issues head on even when we are uncomfortable. I wish you a week of strength, peace and wisdom. I shared this post on my Facebook because I think that’s it’s really important for more people to think like you. Thanks for the share! It’s a topic that we NEED to keep chatting about. Have a great weekend!